When it comes to establishing a solid atmosphere for a Grand Theft Auto title, location is everything. It's not enough to simply throw players into a splotchy suburb of some anonymous metropolis - the city needs to be alive, teaming with civilians and traffic. It needs to have an identity, a social structure, some evidence of reality buried beneath the layers of cynicism and dry humour. Through the years, Rockstar has excelled at maintaining this illusion. The missions and storylines that play out through the duration of the game tie into the cities themselves, along with the characters (and innocent bystanders) that populate it. Although the concept of "free roam" gameplay is nothing new, the Grand Theft Auto franchise, through its use of vast cityscapes that mirror and mock major American locations, push the envelope on exactly what gamers consider to be true immersion. New York, New York! Economic powerhouse, beacon of hope to optimistic immigrants, home to tens of millions of citizens, rife with crime and seedy underworld riffraff; New York City is the epitome of everything that is American. 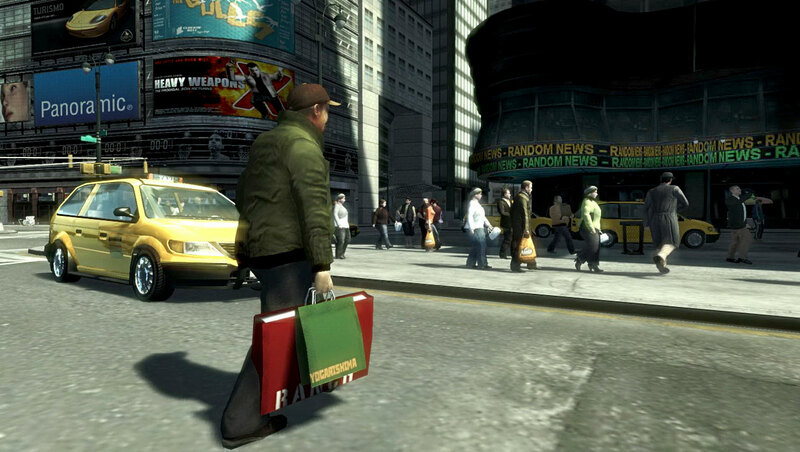 It's really no wonder that Liberty City, Rockstar's exaggerated and cynical portrayal of New York, has called itself home to more than half of the Grand Theft Auto titles in existence. Times Square, New York City. 'Star Junction' is the GTA IV equivalent. 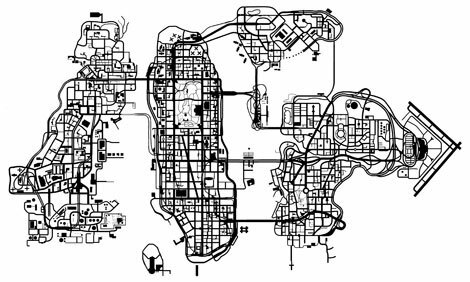 Liberty City first appeared alongside Vice City and San Andreas as one of three major levels (cities) in the original Grand Theft Auto. Due to the game being produced by a British development team, much of Liberty City - along with Vice City and San Andreas - was based on stereotypes and twisted to suit British humour. Since then, it has resurfaced as the city of choice for Grand Theft Auto III, Grand Theft Auto Advance, and Grand Theft Auto: Liberty City Stories. In every incarnation, Rockstar North consistently embraced the sensationalist, cynical sense of humour that was put forth in the first game. Even when Liberty was not openly accessible to gamers in other titles, it played a prominent role in establishing the necessary storylines. In Grand Theft Auto: Vice City, the protagonist (Tommy Vercetti) and the mafia family in which he indebted to both hailed from Liberty City. In Grand Theft Auto: San Andreas, the protagonist (Carl Johnson) returned to San Andreas after residing in Liberty City for an extended period of time. Past incarnations of Liberty City, however, have failed to truly resemble New York. Whereas Vice City was hailed as an achievement in Rockstar's ability to duplicate the overall feel of Miami, the winding streets and communities of Liberty City seemed cold and lifeless by comparison. Things will be different. Rockstar North has wiped the slate clean, shutting the book on the Grand Theft Auto III trilogy and choosing to start anew. Gone are the days of zombie-like pedestrians, robotic law enforcement and stale surroundings. Liberty City has returned as the setting for Grand Theft Auto IV, but this isn't the Liberty City that we have embraced for over half a decade. Looking towards Algonquin from Happiness Island. ALGONQUIN - "Self-proclaimed center of everything." Cultural, commercial, and financial center of the world. If Algonquin residents could have it their way, the region would also be considered the epicenter of everything in the known universe. A word of warning to the inquisitive traveler: questioning the integrity of Algonquin's self-righteous and artificially-sweetened natives will likely get you shot. The Broker Bridge, with Algonquin in the distance. BROKER - "Churches, hipsters and housing projects." The region of Broker is rich in American history, and equally rich in Eastern European immigrants. As of late, the district has also taken to "sprucing up" its ragged image through the restoration of older, run-down neighbourhoods. Don't let Carney Island fool you, though; Broker is just as rough-and-tumble as any other Liberty City district. The Monoglobe in Meadows Park, Dukes. DUKES - "Like the suburbs, only worse." The closest thing to sanity that could possibly be found in Liberty City, complete with overpriced condominiums and unavailable parking. You may even be tempted to refer to the district as "comfortable". Diverse and densely populated, Dukes is home to both the Francis International Airport and Steinway Beer Garden. San Quentin Avenue Station in West Bohan. BOHAN - "Ripe for re-development." Neglected and disrespected, Bohan is the closest thing to hell that you can find in the city (and that's saying something). This northernmost district of Liberty has been torn apart by decades of destructive violence. If you find yourself wandering into Bohan, don't just lock your doors -- weld them shut! The Liberty City Ferry Terminal in Alderney. ALDERNEY - "Industrial wasteland meets suburban hell." If Algonquin is the privileged child of the Liberty City family, then Alderney is most definitely the retarded younger brother -- an endless sea of run-down homes peppered with phallus-like smokestacks thrusting into the sickly clouds above. Simply put? Those that are unfortunate enough to live in the district desperately want to get out. 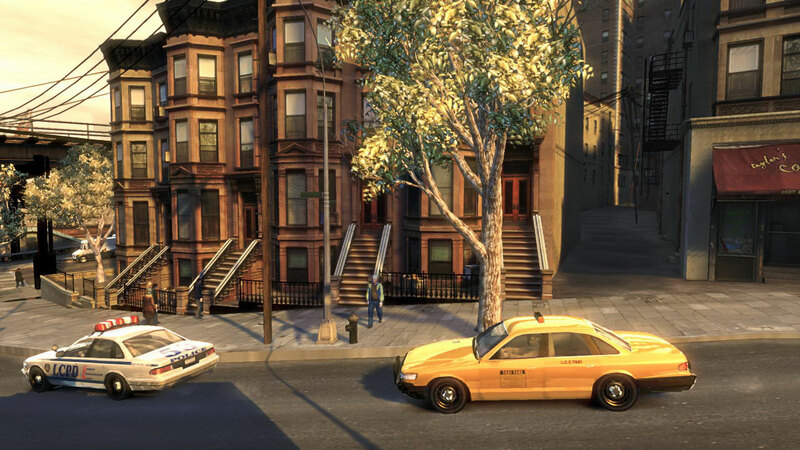 Liberty City's resemblance to New York, N.Y. isn't limited to geographical locations, however. 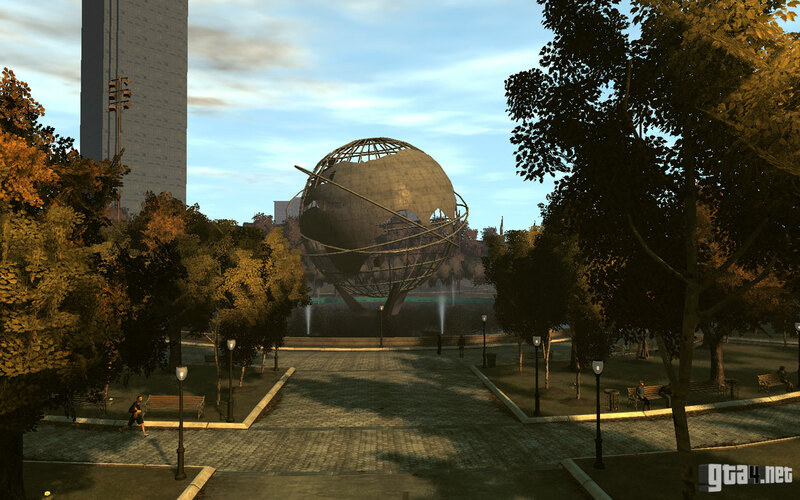 Many of the landmarks that exist in New York are mirrored in GTA IV's Liberty City. The MetLife building - a major part of the Manhattan skyline - has been recreated as the GetaLife building. 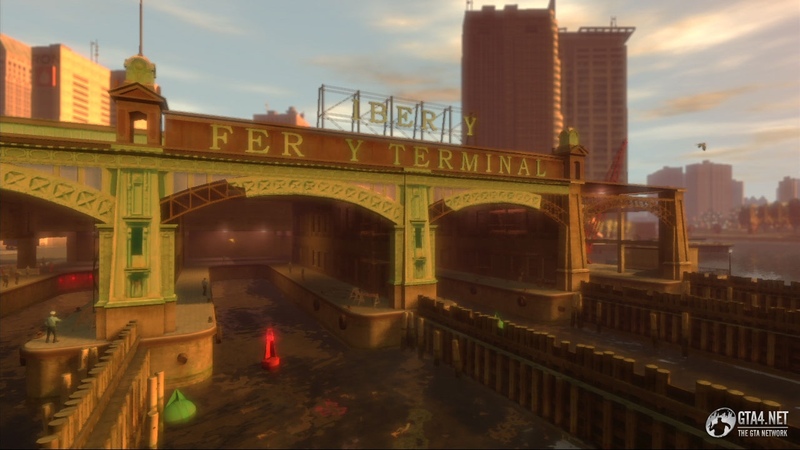 The DUMBO neighbourhood (Down Under the Manhattan Bridge Overpass) exists in Liberty City as BOABO (Beneath the Offramp of the Algonquin Bridge Overpass). 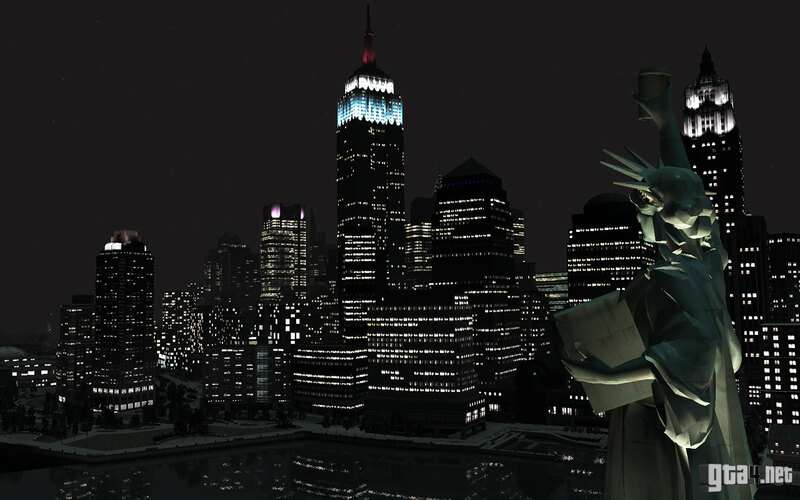 The Statue of Liberty - which wasn't present at all in GTA III - finally makes an appearance as the Statue of Happiness. 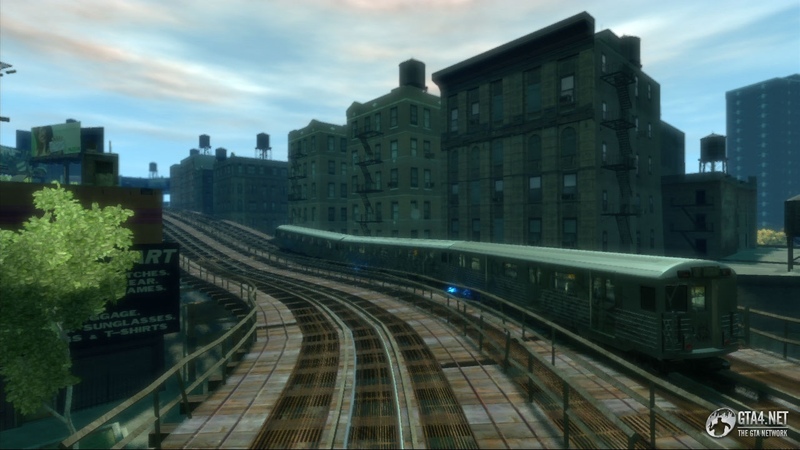 Other notable landmarks of the New York skyline have been duplicated in GTA IV, including the Empire State building, Chrysler building, Flatiron, Roosevelt Island, Brooklyn Bridge, and many more. In an attempt to fully embrace the culture and atmosphere of New York, Rockstar North has also made sure that the citizens of Liberty City echo those of New York City. The eccentric vagrants of Liberty City coexist with the smarmy executive-types. 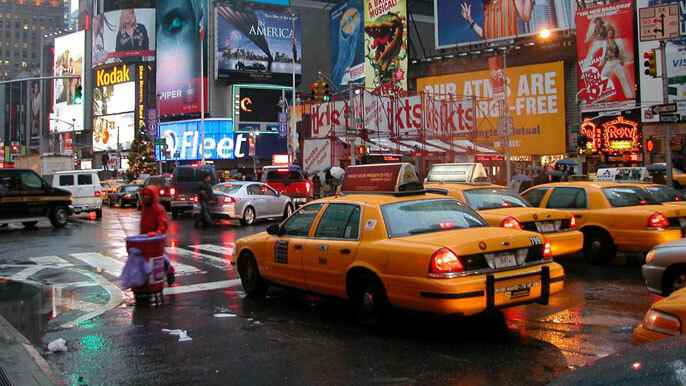 Foreigners try to find their way as tourists stumble through crowded intersections. Crooked businessmen strike deals with ruthless opportunists. Organized crime thrives as the trafficking of drugs coincides with the smuggling of firearms. All of this is interwoven, giving Liberty City the authenticity of a modern-day New York City. 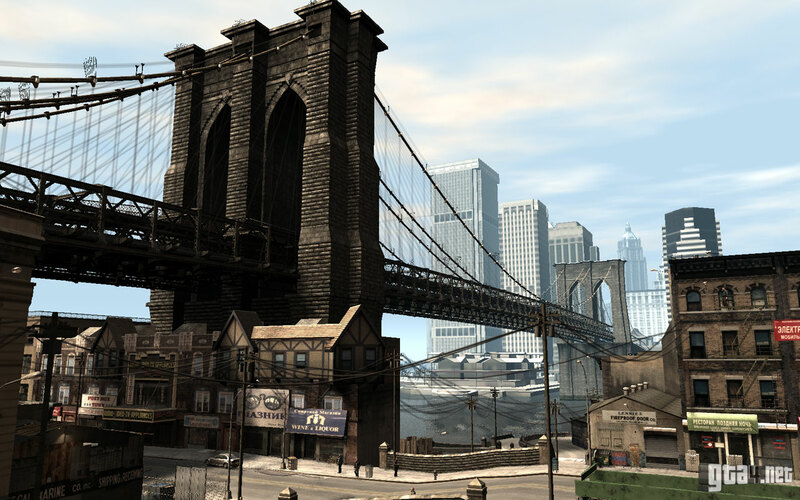 Prior to Rockstar announcing that GTA IV would take place in Liberty City, there were many theories circulating around the web about where the game would be held. In the end, we took a look at three of the most prominent (and reasonable) candidates. If you're in the mood for a bit of nostalgia (or just want to see what brilliant ideas we came up with), the old Setting section is still available for viewing. Enjoy.